Breeze::OS Kodiak©® is our Linux distribution for x86-based systems, see gallery. TCP/IP networking, X-Window server, etc. The operating system is a Linux-basedOS. A BSD one will be added. Ferret Where downloaded files are indexed, and stored when specified. Config Where indices for all system configuration files are stored. System Where indices for all systems files are stored. Share Where indices for packages are stored, and indexed. User Where all user files are indexed, and stored. The future version of Breeze::OS©® will include a completely new file system (Breeze::OS path-spec file-system, TFS [ Patent Pending ]), which relies on a single-level inode storage structure with no folders, and unique keys pointing directly to files. The filesystem is made-up of three distinct sections: vertex, index, and inode. What used to be folders are seen as vertices in a graph; since they are simply pointers to a location. Mount points can be mounted hidden. i.e. only a guard application can access files under the mount point; and every other applications must issue a request, using the SALT protocol. Indices are keys used for searches. will return all files that were saved with the keyword sales in their path specification, along with either car ortruck. The first version of the Breeze::OS File System (TFS) will be based on the BSD-FFS file-system. Directory scanning becomes a simple search on path-spec keys, since there are no longer any folders to be seen. File retrieval is also performed as a search request. In the second version of TFS©®, database features will be added, using its path-spec capabilities; which will allow the retrieval of database rows, that are linked together on-the-fly, and returned to the calling application. The primary and secondary keys will be used as path-spec keys in the file system. 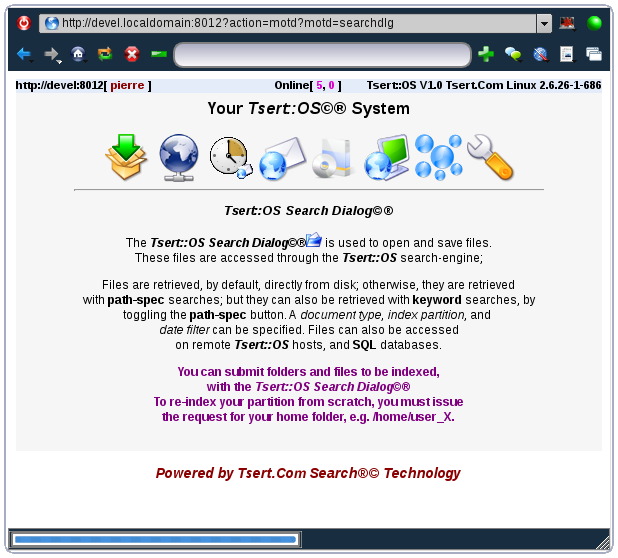 The user is given three ways to interact with the system -- a shell, asearch-dialog, abrowser, and a Launcher. 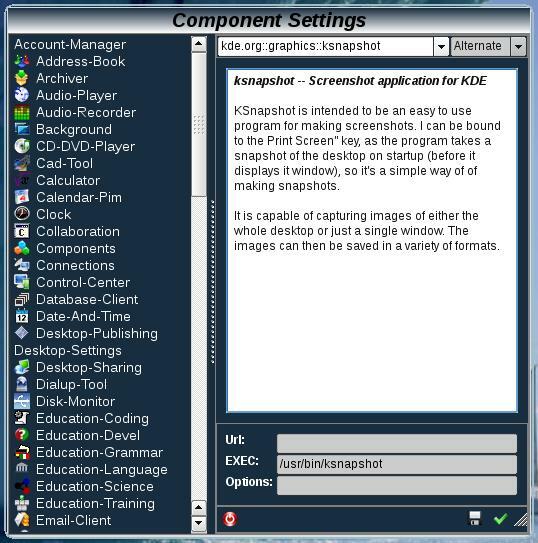 The graphical user interface is anchored on the Thin::Window, the Search-Dialog, and the Launcher, and uses the PI-Box window manager. The UI specification file of the Launcher is here. The UI specification file of the Packager is here. Breeze::OS MOTD(s)©® allow you to display company or deparmental info pages to your users. The security manager responsible for content management is the one responsible for managing and updating MOTD(s), The Breeze::OS itself, has by default, system and user interface information as MOTD(s). These system MOTD(s) can be replaced by the security manager. Breeze::OS Reminder(s)©® are messages that temporarily appear on your screen; informing you of problems with the system, possible intrusions, clues on how to do things, arrival of priority email or other types of message, etc.. Only basic system and miscellaneous reminders can be turned-off. High-priority reminders cannot be turned-off. TheNLP engine is used to read emails and reminders; then the content extracted is used to collate a series of animations either in Flash or png/jpg images (Picto language©®); which are then displayed as reminders with an associated link to the full-text of the message [ Patent Pending ], instead of a rich-text version of the reminder text -- in the base version of our OS. The photo of the sender, if available, fades-in at the end of the reminder being displayed. The base version of our OS may use keywords from the subject line, etc., to do the same as the NLP engine does. The reminder XML schema will be embedded, or linked into a problem report schema, to provide problem reporting and resolution support to Breeze::OSoperating systems. TheBreeze::OS©® indexing engine uses a /etc/fstab- like file/etc/ifstab. It uses the afore-mentioned configuration file, whenever an indexing of the entire system is desired. The configuration file specifies all the paths that are to be indexed, who the owners of these paths are, and how these paths are supposed to be indexed, (what type of files should be indexed, which ones should be ignored, and if inflating zip/gzip archives should be done before indexing). When saving a file, the system automatically indexes the newly saved file, and may do a content analysis, with the NLP engine to try to understand the content of the file. Content search is made possible, because of that analysis. See some preliminary results with the following files. the first is by trigerring a keyword search, as in all search-engines. the second way is to trigger a content search, using a set of keywords. the third is to retrieve file(s) by specifying a file name or file type. the fourth is to retrieve file(s) by specifying an actual path specification. The search-engine sees the path specification, (path-spec searches), as a slash-separated set of keywords, e.g. /bin/search. Breeze::OS©®is straightforward in its ability to allow remote connections. The system relies and is anchored on a search-engine mimicking an Internet search-engine accepting search queries, and protects these connections with our SALT protocol©®. You can turn-on remote connections by changing your remote connection preferences with the Connections manager. In order to be able to establish a remote connection, you simply log into another machine, which could be your laptop, also running Breeze::OS©®; you then access the login UI-page to access your home computer through your home computer'sBreeze::OS address and port number 8012©®. The connection is established, as long as your home computer's host and domain name can be resolved (dynamic DNS service), as for a real internet website. You then simply issues search request for files as if you were working on your home computer. Connecting to other systems from your machine is accomplished as above; but you must have an account on the machine you wish to access. The security manager of the remote machine must have provided you with an account with password and optional pass-phrase. You must then supply that information through the loginUI-page to access the remote machine. This remote connection capability is the basis for future Thin::Client©® implementations. Thin::Client©®features will be offered with the server version. Users will be able to connect to a server, acting as a central repository of indexed and content-analyzed files, through a thin client terminal; by simply accessing the Breeze::OS©® port 8012. The Thin::Client©® machine connects to the repository at boot time, using pre-configured remote connection settings. The hardware requirements for such a Thin::Client©®server, are obvioulsy more than for the desktop version. The preferred platforms will be, either an Intel Pentium-4, equivalent Athlon, or a 64-bit server, with at least 1G of memory; and the disk space required to store hundreds of gigabytes of files. To allow Thin::Client©® terminals to run applications on the server itself, a faster or multi-processor server will be required, preferably a multi-processor server. Tsert::Ferret©® willl allow users, whose companies have such a server running, to schedule a daily ferreting run (information retrieval task) on the repository. Tsert::Ferret©® will then produce a content analysis report which contains paragraphs (blurbs) of text, extracted from the returned files, which seem to talk about what the user specified in their ferreting query. Another future way to remotely connect is through the Tsert::Collab©® component. Tsert::Collab gives the user the ability to setup a collaboration session by sharing a session-id with other users. Once a connection is established with another user, you can then collaborate on an HTML page displayed in an HTML editing window. Out-of-Band messages in the Tsert::Collab©® component arrive as Breeze::OS reminders. The component manager is used to configure your desktop according to the type of applications you wish to use. Every type of application is listed, and the user selects their application of choice, for each type of component (e.g. office-suite, word-processor, email-client, instant-messenger, personal information manager, music player, etc.) The applications selected in the components manager are displayed in the toolbar, found both in the launcher and the Breeze::OS UI pages. Remote connections are protected by the SALT©® and SSL protocols. The Karakul©®, Kodiak©®,and Katmai©® BSD versions of the Breeze::OS©® operating system will include our Breeze::OS Salt protocol©® at the level of the IP stack to allow secure networking without the need of a firewall (as long as, only salted ports can be opened.) It is the salt-setting that is exchanged securely among peers in a private network, allowing each peer to match a given key. The matching may be done at the level of the IP,TCP, or HTTP protocol level. You will be able to make your network both public and private; because the Breeze::OS Salt protocol©® allows the use of a given number of reserved algorithms. Access to other files, (system, package or ferreted files), is allowed only if the user making the request has access to the specified files. Content information, see NLP engine. Breeze::OS©®gives the user the freedom to provide his/her own UI pages, as long as, places are kept for Tsert.com. copyright, trademark, launcher, and logos. This capability is provided by allowing the user to specify XSL(T) style sheets or HTML &CSS templates.Breeze::OS©® uses these style sheets or templates to generate User-Interface (UI), Tsert::Packager, Tsert::Archiver, or Tsert::Ferret HTML pages. This php-like capability of dynamically generating HTML pages will be included in the Breeze::OS script language, found in our integrated testing environment (ITE). Subsequent releases of our operating system will use XML, as the document format for all system configuration files, e.g. fstab. All configuration files, such as the files found under the /etc folder will be translated into our XML DTD, for system files. A fully-integrated developer version of Breeze::OS©®will be released, which incorporates our ITE, updated with Tsert UI pages, development life-cycle and process. All of our development tools will be provided, as part of that release. This version will be able to serve a small team of developers (between 25 and 100 users). In the future, we will allow the user of our operating system, the ability to automatically upload their document files for translation, through our translation service. In the future, we will allow the user of our operating system, the ability to automatically upload their source code files for testing, through our software quality assurance service.